Thread: The Gabriel Lone Ranger line! I'm astonished that no one has put up a thread in honor of this terrific 10" line! With their removeable clothes, hats, boots, guns and other accessories, they're at least as play-friendly as Megos, and when coupled with the awesome, fully-articulated 12" horses, they're pure Western adventure and fun! When I was about 6 years old (in 1976) my friend Craig LeFevre (who also had Megos galore) introduced me to the wonders of the Lone Ranger. Craig had a number of horses and figures, and also the little comic book inserts that told us the origins of the Ranger and Tonto. I soon began collecting the figures myself, though they were pricier than Megos or Star Wars, so my cache was limited. My sister and I combined her Barbie's with my Lone Ranger and Butch Cavendish, and an endless variation of the classic capture-and-rescue story was born! 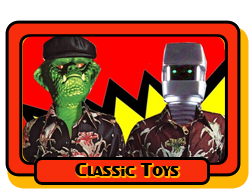 Forthcoming will be a list of all the disguises and playsets. How many do YOU have, and what's your Lone Ranger story??? I loved this line too! It was a heckuva lot of fun to play with. Another wonderful toy. I recently won a Lone Ranger and Silver CHEAP but am getting screwed by the seller because he's not answering any of my emails. AAARRGGG! When I was 5, I had my tonsils taken out and the first thing I saw as I emerged from the anesthesia was The Lone Ranger astride Silver. Almost 33 years later, I can remember who was in the room, how the room was arranged, and how Silver was set on the little hospital meal table in a somewhat-reared up pose. Awesome memory of something that should have otherwise been (somewhat) traumatic. i have the lone ranger and tonto roday. love the line. Hey! Where's the waiter with the water for my daughter?